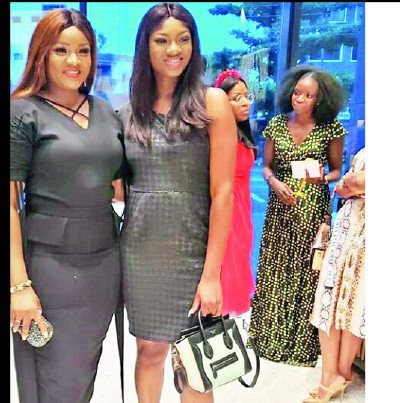 Nollywood star, Omotola Jalade -Ekeinde has narrated how she almost lost her first daughter Princess Ekeinde, at barely one-year-old. the beautiful lady recently graduated at 22, and her mother went went down memory lane, recalling how she almost lost Princess. “It all started with her running a temperature. I can’t remember how many hours anymore. She is our first child and we had not much experience. We gave her some medication, but she didn’t seem to get better. Then suddenly, she slipped into what seemed to be a coma. I panicked, we all did, even neighbours and everyone, was screaming and suggesting all sorts. “She was clenching her teeth fiercely, then an old woman we knew in the neighborhood suggested we put a spoon and pour salt into her mouth (totally wrong move. Please do cold shower instead). We rushed her to the hospital, and at first, the doctors were a bit reluctant (I guess they thought it was a lost case). However, almost without much hurry, she was worked on and miraculously, she came back! Continuing, the mother of four revealed the challenges her daughter had to face because of her predicament. At first, it was challenging. As she grew, she struggled, mostly with her sight. She couldn’t see things right in front of her! Even in school, she would be put in front and still not see. “At every level, Princess worked extremely hard, harder than others. Always trying to prove everyone wrong, and passed. Every time we feared or doubted, she passed with flying colours and moved to the next phase! Miracles before our eyes. Today, she not only finished well from University, she also insists on going for her Masters and is conquering all her fears.